Yes, vegetables are in this muffin. A fun way to sneak veggies into our diets is to add in various vegetable purees to our everyday dishes. 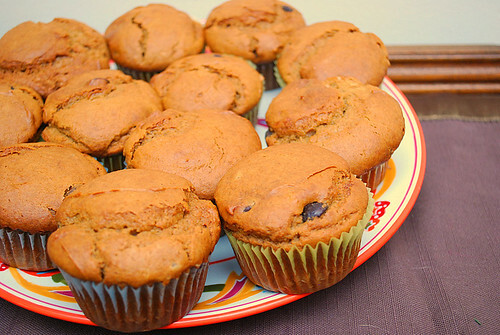 In these peanut butter & chocolate chip muffins, carrot puree is used to add a little color, sweetness and some nutrients. You may have heard of using applesauce in various baking recipes as a way to cut out some fat and sugar. The same idea is used in the recipe with carrot puree. You won't even detect the carrot in these muffins since the peanut butter and chocolate chips are pretty dominant. Either way, you'll be surprised and feel good to get an extra dose of something healthy in these muffins! Preheat oven to 375F. Line a a standard 12-cup muffin tin with paper liners. In a large bowl, whisk together flour, baking powder, salt and brown sugar. In a medium bowl, whisk together the melted butter, peanut butter, eggs and milk until smooth. Pour into flour mixture and stir until just combined. Stir in chocolate chips. Batter will be thick. Divide batter into your paper-lined muffin tin. Each cup should be filled to the top, not just half way up, to ensure you get a nice dome on the muffin. Bake for 17-20 minutes, until a tester comes out clean and the top of the muffin springs back when lightly pressed. Cool on a wire rack. These look great - who doesn't love peanut butter & chocolate? And making them more healthy - bonus!